A solitary standing stone in a farm field on the outskirts of Holyhead. The Ty Mawr stone stands about 9 feet tall and was probably erected in the Bronze Age. The stone is heavily twisted towards the top as if a giant hand had given it a mighty twirl! 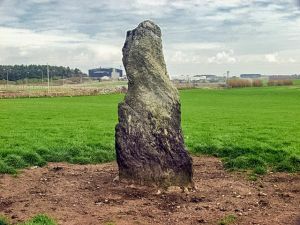 The Ty Mawr standing stone is located just a short distance north-west of the Trefignath Burial Chamber (also open access and also in the care of Cadw). For that reason, you may sometimes see it referred to as the Trefignath Standing Stone. Unfortunately, the encroachment of modern civilisation means that the stone is beside an aluminium works, and quite near the busy A55 trunk road. On the other hand, there are good views north to Holyhead Mountain! This fabulous property rests in the village of Rhyd-wyn near Holyhead, and sleeps six people in three bedrooms. 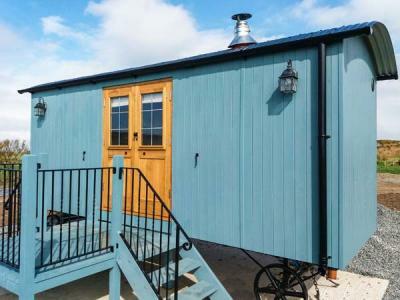 This working farm property is in the village of Holyhead in the region of Anglesey and can sleep two in one bedroom.